The rising square corresponds to the keel of the boat. The half-bend represents the section of the hull from the crop of the bulge to the sheer. The unnamed third piece corresponds to the section of hull between the crop of bulge and keel. Typically passed from father to son, Taylor explains how “sir marks” inscribed on each mould piece correspond to specific transverse sections, or timbers, of the boat. When these marks are properly aligned, the shapes of various timbers can be formed, including the fore hook, the midship bend, and the after hook. Builders trace the shape directly onto timber stock and then cut out the shape of the timber. “Further adjustments enable the builder to obtain the timber shapes of boats of various sizes. By changing the size of the rising square to match the keel size of the desired craft, by increasing or decreasing the width and height of the two curved pieces, and by increasing or decreasing the distance between the principle timbers when they are placed on the keel, boats of various lengths can be designed”. “All early boats built in the Elliston area were built by “mould”. Without doubt those who first built boats in the Elliston area, in common with early local builders elsewhere in Newfoundland, copied methods used by their forbearers in England… John Barrett told me that his ancestors, some of the first craftsmen in Old Perlican, brought out their moulds with them when they came from the Old Country around 1710. It is very likely that the first builders in Elliston did likewise”. 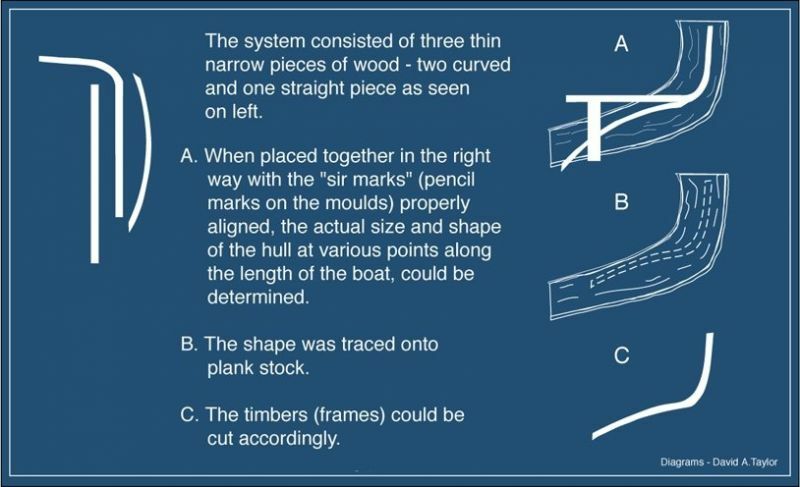 Once used in Winterton to “mould out” all of the timbers before assembling them onto the keel, Taylor notes that during his research, builders in Winterton were only using the three-piece mould for the three principle timbers: fore hook, midship bend and after hook. A similar pattern can be identified throughout the province as sir marks lost meaning between generations and methods and techniques used for boat building changed. While many can recall their fathers and grandfathers using this method, there are only a handful of builders left in the province that have the knowledge to use the three-piece mould method themselves. David A. Taylor, Boat Building in Winterton, Trinity Bay, Newfoundland (Gatineau: Canadian Museum of Civiliation Corporation, 2006 ). Hilda Chaulk Murray, Of Boats on the Collar: How It Was In One Newfoundland Fishing Community (St. John’s, NL: Flanker Press, 2007).